Lotus used this week’s Goodwood Festival of Speed in the United Kingdom to unveil two new special versions of its Exige sports car. They were built to mark this year’s 70th anniversary of when Lotus founder Colin Chapman built his first race car, based upon his philosophy of “performance through lightweight.” The two cars, the Exige Type 49 and Exige Type 79, were built by the Lotus Exclusive personalization department and honor historically significant Lotus Formula 1 race cars. The Exige Type 49 salutes the Lotus Type 49 that Graham Hill used to clinch both the Drivers’ and Constructors’ championships back in 1968. Fittingly, the modern car features a solid red exterior with gold accents, just like Hill’s race car. The Exige Type 79 salutes the Lotus Type 79 that Mario Andretti used to win the Drivers’ and Constructors’ championships in 1968. His car was painted black and also featured gold accents, with a modern version of the livery recreated for the special Exige. Inside, each cars’ racing colors are referenced, with Lotus’ in-house manufactured carbon race seats trimmed in black Alcantara and finished with color keyed red and gold, or black and gold, contrast double stitching. This is echoed by the door panels and face-level vents, transmission console, and complemented by the cabin’s anodized aluminium and carbon fiber elements. The final touch is an old-school wooden gear knob. 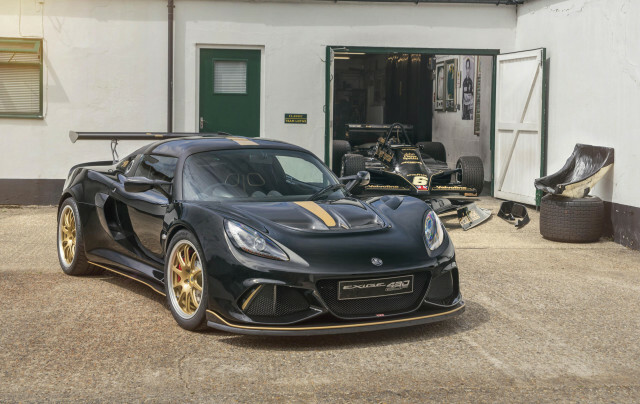 Both cars are based on the latest Exige Cup 430, which is the fastest Lotus road car to lap the company’s Hethel test track, requiring 1:24.8 seconds for the 2.2-mile track. Powering it is the familiar Toyota-sourced 3.5-liter V-6, which Lotus has supercharged to the tune of 430 horsepower and 325 pound-feet of torque. It’s enough to see the Exige Cup 430 hit 60 mph in 3.2 seconds and top out at 180 mph. Sadly, the Exige isn’t sold in the United States in street-legal form so these special editions won’t be coming here. ‹ Previous Should I buy a Sony compact camera?